Nick Wilford, Speculative Author: NaNoWriMo 2014 - Halfway There! 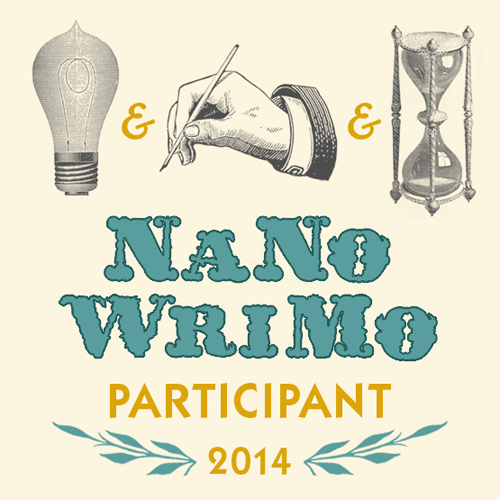 NaNoWriMo 2014 - Halfway There! No, it's not halfway through the month, I realise we're already past that, but I am halfway through my NaNo 2014 effort. Today, I typed my 25,000th word. I've been consistently a couple of days behind since the start, but that's okay. I only need 1,786 per day to finish on time, not much over 1,667. So, yeah, I'm just here to stick my head over the parapet and let you know how I'm doing this month. I've been typing furiously away, and certainly never written 25k in 17 days before, so I consider that a win already. If you've never tried NaNo, or are perhaps cynical about the value of writing just for the sake of obtaining a speed goal, try it! It's really not all about the word count. NaNo, for me, is about trying to instill good habits of writing, writing consistently, and writing around whatever hazards might fly into your path. I didn't really get started until Day 3 - I'm unused to writing on a weekend, and hadn't written for two months beforehand (tsk! ), so I wasn't prepared for that first Saturday. Then, my laptop threw a major wobbler and wouldn't connect or open Word, so I scrawled on several sheets of good old-fashioned paper until Day 6, when I decided to hunt down my stepdaughter's forgotten laptop (she does everything on her iPad these days). I'm still using it and have just about got used to the smaller screen. About those consistent habits - I really do think it's great that NaNo makes you write every day. I've made up for that first weekend and haven't missed a day since. I do a paper round seven days a week, and have been getting up at 4am on weekends to get my writing in first, up to 2000 words. I maybe wouldn't do so much in the future, but on the Mondays I've been able to easily pick up where I left off, whereas Mondays in the past I've been banging my groggy head on the desk trying to pull myself back into the "zone". So, thanks NaNo! I've learnt stuff I can apply going forward. I'm carrying on my YA trilogy that I actually started during NaNo 2012, so it's quite fitting in a way. Except I'm not sure it will be a trilogy any more - when I finish Part 2, I'm really not sure what will come next, although that may yet reveal itself. I'll finish Part 2 before I finish 50,000 words, and I do have ideas for a prequel that will go into more depth about the events that led to the worlds we first encounter in Part 1. Maybe this will then be Part 1, or maybe 1 and 2 will become one longer work, plus a prequel - I'm open to all possibilities at the moment. Oh, and apparently, I'm not a rebel any more for carrying on a previous work. Hey ho, there's my image ruined! And here's a little extract - it might be rough, but I've been learning to get over that. Everything needs editing anyway, and getting the story down should come first! “Where am I?” he said, blinking and trying to make out any shapes in the darkness. But once his nostrils registered the overpowering odour of wet fish, he had his answer before Ez could give it to him. With his head turned to the side, Welles could now discern the looming shape of the fish crates stacked all along the wall. At least the pungent smell gave him something to distract him from the pain. “Right here.” His voice came from Welles’s other side. “Strong and silent type , as usual,” said Ez. They all fell into a silence after that, but it was a busy silence, each processing their own thoughts as the boat moved rhythmically through the water. At least the weather seemed to have calmed down. If you're doing NaNo, how's it going? What else are you up to in November? Awesome progress, Nick. And I think you are already a NaNo winner for having learned so many things from the experience thus far. That's awesome, Nick! And 25,000 in seventeen days is no small feat. Keep going - you may still cross 50,000. At least you are progressing. Congrats on hanging in there. Sounds like you've been doing good, Nick, and your sample raises questions, of course. That's great that you're coming along in NaNo. I did NaNo years ago, and just hitting the 25,000 word mark was one of the things that gave me the push I needed to keep going. Good luck! Congrats on your NaNo progress, Nick! Great job! Just keep going and be proud of all you do. The snippet has great flow. Congratulations for doing so amazingly with NaNo! I bow to you. I tried it one year. Yeah, stopped there. lol Keep at it!!! There are times when pen and paper make all the difference. Good luck to you with Nano! Sounds like you're off to a great start, even if it is more than halfway through the month. Your writing organization sounds positively fitting for your style, and I wholeheartedly agree, "Everything needs editing anyway..." Get the words out before they evaporate into thin air! It sounds like you are making good progress! Keep up the good work! Woo hoo! You go! I'm working my way back into my next novel. Yikes. I asked you over on the NaNo site how you're doing, but now I'm here and I see how you're doing! Or were doing about 7 days ago! :) Go Nick!! My friend in the Netherlands finished hers today - a very slow year for her too ;) - or rather, she hit 50k. We were chatting about how it's been one of the more 'dragging' years we've done. Yay for Nanowrimo. I wish I had known you were doing it earlier. You've still got plenty of time to finish on time, and if you get a novel finished that is awesome. I am one of those who kept on with an already started story, but that's what's so awesome about Nano--you can just use it for whatever you need to get motivated on. Enjoy the writing! you're doing fantastic, Nick!! keep it up!! !